Note: MC: marginal costs; MB: marginal benefit. MCrrF / MBrrF: marginal costs / marginal benefit for resource-rich farmers. MCrpF / MBrpF: marginal costs / marginal benefit for resource-poor farmers. Source: Virchow (1999). Farmers will go on maintaining their production systems, and consequently, a specific level of PGRFA diversity, as long as their private marginal benefit is higher than the private marginal costs they incur from the loss of higher yields or other benefits possible under a change in the production system. A change of the production system to a "modern" one would inevitably reduce the level of agrobiodiversity. Wherever farmers are able to change their production systems, the costs of maintaining the production system and therefore the de facto conservation of PGRFA diversity have to be reflected as opportunity costs of potential income lost by not utilizing modern varieties. 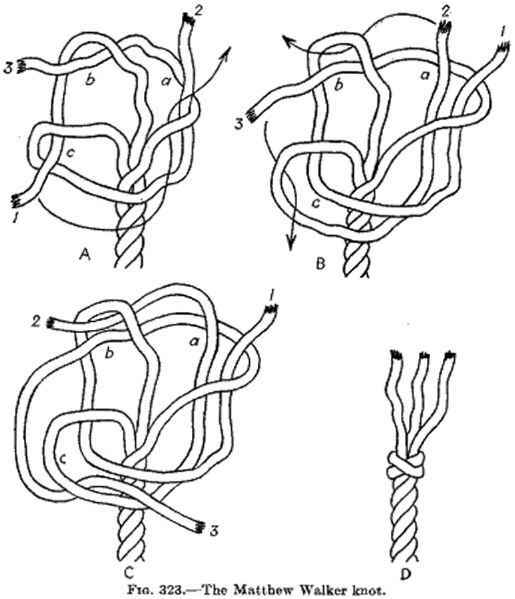 As described in Fig. 6-3, the marginal costs of maintaining PGRFA as traditional varieties are the lowest for the group of economic and ecological marginalized farmers without any other production possibilities, and hence, without any opportunity costs for maintaining PGRFA-diverse production systems (represented by the marginal cost curve of the resource-poor farmers MCrpF). The only opportunity costs this group faces arise from either the abandonment of agricultural production due to out migration from the marginal areas or the change to nonagricultural occupation. Technical improvement and development at the farm level creates the possibility of choice between traditional varieties and modern varieties and the introduction of modern varieties may therefore occur. Because of the change of their production system, there will be an inevitable decline in PGRFA diversity in their fields. This decline is characterized by the change of area under traditional varieties from qrpF (resource-poor farmers) to qrrF (resource-rich farmers). At the farm level, the decision is made whether to cultivate traditional varieties or not, and to what extent. This decision is solely determined by the individual or farm-level benefit-optimizing criteria, which are also influenced by the economic and ecological framework, i.e., the access to resources and technologies. Countries involved in the conservation of PGRFA may expect direct market benefits for the breeding activities derived from the raw material as well as food security benefits through the insurance value of genetic resources (i.e., stabilized or increased food production) and the functional value (reduced degradation of natural resources) as part of the breeding value. However, while aiming to conserve their PGRFA in situ, these countries face one problem in determining their country-specific optima of PGRFA diversity level: as discussed above, farmers provide the country's current PGRFA diversity as a free good. At the country level, the social marginal costs are mainly derived from the opportunity costs for foregone increased food production through the renouncement of the utilization of modern varieties. To increase national food security, many countries have to continue and increase the integration of the resource-poor farmers, the "custodian" of PGRFA diversity, into the market (von Braun and Virchow, 1997). As a rule, one traditional variety may be maintained in situ on an area less than 100m2 for crops with orthodox seed and less than 250m2 for vegetatively propagated crops. For other crop species, e.g., with recalcitrant seeds, perennial species, and species with long life cycles, less than 1 hectare is necessary (Bticken, 1997).4 To provide a margin of safety, it may be assumed that each traditional variety may be planted on average on 1,000m2 and on 10 to 50 farms so that crop failure on one farm does not risk loss of the variety. Therefore, the total area necessary to conserve one traditional variety of any crop species would be less than 5 hectares. Because of this minimum safety standard (MSS), the country's conservation objective could be fulfilled with the minimum area requirement at qn in Fig. 6-4. More area planted to the specific traditional variety will increase the social marginal costs of the in situ conservation in a specific country (MC„). In contrast to the country's optimal area needed, farmers— according to their individual optima—utilize altogether far more land (characterized as qp in Fig. 6-4) for the traditional variety than is socially optimal (qn), reflecting the opportunity costs at the national level. 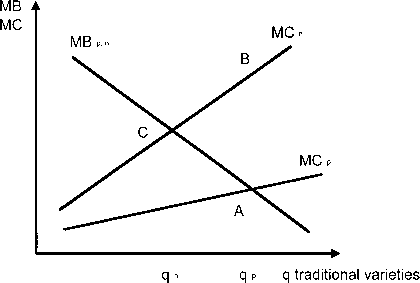 MCn / MCP: marginal costs on national / private level. MBp n: marginal benefit on private and national level. Source: Virchow (1999). 4 For instance, the area requirement for maize is 60 m2 and for wheat only 0.75 m2. At last count, only 74%, 70%, and 57% of the area planted to rice, wheat, and maize, respectively, in developing countries is planted with modern varieties5 (Alexandratos, 1995). Pretty (1995) estimates that a total of almost 2 billion people are still not benefiting from modern agriculture. Due to the area still under traditional varieties, where farmers grow the same set or overlapping sets of varieties there is the negative external effect for society as a whole (marked in Fig. 6-4 as area ABC). The private decisions may provide optimal levels of on-farm production systems, thereby including a specific level of agrobiodiversity. But it may also provide suboptimal levels of PGRFA diversity from a social perspective (e.g., an oversupply). This suboptimal level of PGRFA diversity from the national perspective is reflected in the opportunity costs at national level.